ON THE back of a record year in 2017 and in the face of widespread drought across much of eastern Australia, bull sale volumes and average prices held up remarkably well in 2018. Although the number of bulls sold at auction by the 10 major breeds was down by about 10 percent and average prices were down by a similar amount, the 2018 results were certainly better than expected for many bull breeders. The major reason that sales volume and averages held up so well appears to be the relative strength of slaughter and live export prices during 2018. Although not reaching the record heights of 2016-17, commercial slaughter, feeder and store cattle prices held up well during the year due to strong international beef demand, encouraging commercial breeders to invest in genetics for the future of their herds, regardless of the weather constraints. Continuing optimism about the prospects for the Australian beef industry in the rapidly changing global market continues to underpin the bull-breeding industry. Clearance rates seen at bull sales this year, where reported, were generally below the very strong clearances seen in 2017. Individual studs and breeds which have a strong footprint in NSW and southern Qld were the worst affected by the widespread drought in those states, because breeding cow numbers have been cut back heavily in both states, evidenced by high and near record rates of female slaughter. The ten largest beef breeds this year sold 20,711 bulls at auction, for a total value of $142.2 million. Compare this with 2017 sales of 22,177 bulls for $165.7 million. 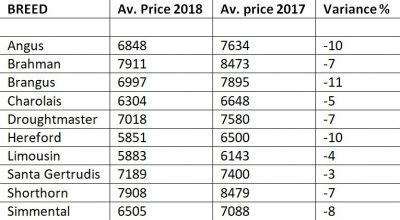 Presented here are two tables for average price and number of bulls sold for 2018 compared to the previous year. Note that the numbers presented for the ten largest breeds are for bulls sold at auction only, as it is impossible to account for bulls sold out of the paddock in any meaningful way. Below is a summary of individual breed results listed in descending order based on this year’s average breed price. The Brahman breed has benefited from the continued strong live export market selling 2281 bulls at auction in 2018 just seven less than in 2017. The breed’s average price of $7911 was the highest for all major breeds this year at auction, being just 7pc below the 2017 average price of $8473. Brahman Breeders general manager, Anastasia Fanning, said 2018 had been another strong year for the breed. “In what has been a very tough year on the land, the result at Brahman Week and the entire draft of Brahman auction sales for 2018 is a credit to the breeders and the breed,” Ms Fannining said. While numbers sold at auction dropped from 583 to 447 this year – a 23 percent drop, hit hard by drought in heartland Shorthorn breeding regions – the average sale price of $7908 was just 7pc below last year’s average of $8479. Santa bull sales at auction were down by 10pc to 1907 this year, but the average sale price of $7189 was down just 3pc on last year. Santa Gertrudis Breeders Association general manager, Stephen Ware said while the number of bulls sold was back a little, this was to be expected considering how dry it was across the continent. “The average is also back a little on last year, but that is also expected in dry times. It has been another successful year and a testament to the Santa Gertrudis breed,” he said. The breed’s season-high price of $82,500 was paid for Waco Napoleon N80 (P) selling to Craig Hindles, Bullamkinka Stud. Another highlight was the 100 percent clearance recorded for the Blackall sales, in the middle of a severe drought region, due to the support of commercial breeders from across the country, Mr Ware said. Sales at auction of Droughtmaster bulls were down by 15pc to 1578 this year, but the average price of $7018 was just 7pc down on the 2017 high of $7580. Standout Droughtmaster result was the Glenlands sale which topped at $80,000 and averaged $11,035 for 155 bulls with a 98pc clearance. The number of bulls sold and average price both exceeded the 2017 Glenlands sale. The National Droughtmaster sale in Rockhampton was solid, clearing 438 bulls for an average of $8387, with the number of bulls sold and average a little down on the 2017 sale result. Like other breeds in the top ten list, Brangus did not hit the highs of last year, but still had a very solid selling season, turning over 418 bulls for an average of $6997. The number sold was down 13pc on the 488 bulls sold last year, and the average price was down by 11pc on the 2017 average price of $7895. Highlight sale for the Brangus breed this year was the Rockhampton Brangus Sale which cleared 152 bulls to a top of $34,000 and an average of $8141. The market-leading Angus breed again had a very solid year, selling 9258 bulls in 182 auction sales compared to 9379 bulls in 167 sales in 2017. The average price of $6848 was down by 10pc on last year’s record high of $7634. Angus Australia general manager Peter Parnell said the reduction in average price was a direct function of the widespread drought across much of Eastern Australia. “Despite near record averages by some vendors, there were numerous cases where sale averages were down significantly compared to previous years,” Mr Parnell said. 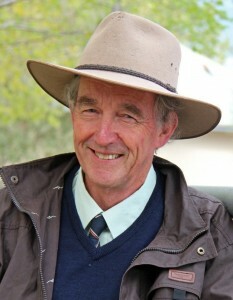 “The majority of vendors have reported strong clearance rates for bulls, which was unexpected – indicating new buyers coming to the market to offset the reduced demand by some customers requiring fewer bulls due to reduction in cow numbers as a consequence of the drought,” Mr Parnell said. Leading the averages for the European breeds was Simmentals, with an average price of $6505 for 995 bulls sold at auction this year. The average price was down 8pc on the 2017 average of $7088, but the number of bulls sold were just fractionally down on the 1003 bulls sold in 2017. Standout result was the Woonallee sale in South Australia, which recorded a complete clearance of 101 bulls topping at $52,500 and averaging $9287. Bonnydale in Western Australia sold 63 yearling bulls to a top of $19,000 and an average of $8984 was another highlight sale, with a 99pc clearance. The Charolais breed also had a solid year, selling 1457 bulls for an average of $6304. 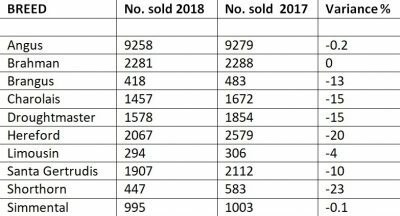 The number of bulls sold was down 15pc on last year, while the average price was down just 5pc on 2017. Charolais Association breed development manager Colin Rex said overall the demand for Charolais sires was exceptionally good considering the worst drought affected areas are traditionally where the breed has received strong support. “Vendors offered a lower number of bulls in 2018 compared to 2017, and this has been reflected in the reduced number of bulls sold at auction,” he said. “The average in 2017 was a historical high, so to maintain an average close to 2017 shows the industry recognition of the benefits of heterosis and crossbreeding,” Mr Rex said. 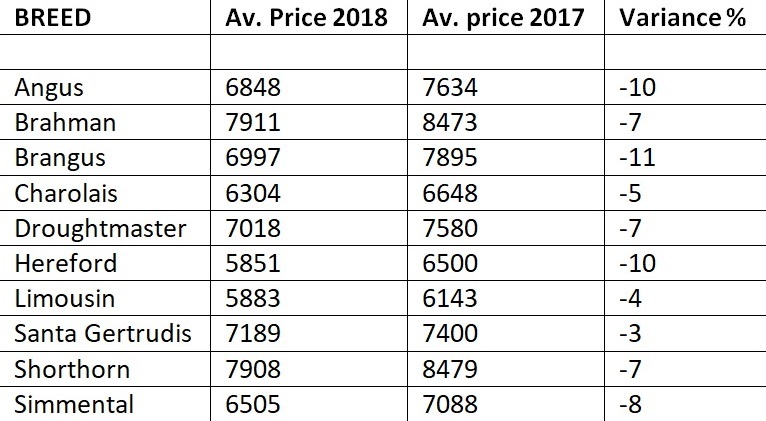 Both numbers sold and average price held up well for the Limousin breed in 2018. Numbers sold at auction declined just 4pc to 294, and the average price also declined by just 4pc to $5883. Topping sale averages for Limousin sales was the Warrawindi stud in SA which sold 20 bulls for an average of $7000, followed by the National Limousin Sale in Wodonga where 36 bulls sold to a top of $20,000 and an average of $6556. Largest sale was the Mandayen sale in SA which cleared 57 bulls to a top of $16,000 and an average of $6289. The average price for Hereford bulls declined by 10pc to $5851 this year, while the number of bulls sold at auction declined by 20pc to 2067 reflecting the widespread drought across much of the traditional Hereford breeding areas. While not making our top ten breeds list based on number of bulls sold at auction, results for the Speckle Park breed this year are well worth noting, with 106 bulls selling for an average of $10,389 compared to 135 bulls sold for an average of $10,218 in 2017. 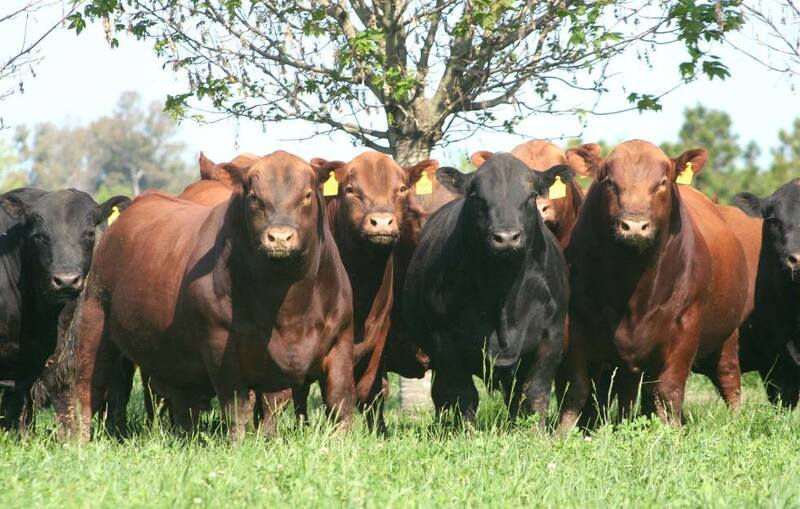 The Wagyu breed also does not rank in the top 10 breeds based on the number of bulls sold at auction, as the overwhelming majority of Wagyu bulls are sold out of the paddock. However those Wagyu bulls offered for auction sale – typically, elite animals carrying in-demand genetics or emerging traits such as polledness, where vendors are trying to capture buyer competitive tension through the auction process – sold strongly this year, with 120 bulls averaging $12,270. This result was strongly influenced by the top priced bull sold to South African interests for $185,000. Taking this bull out of the calculation, the remaining 119 Wagyu bulls sold for an average of $10,818. Beef Central’s annual survey of beef breed bull sales includes the top 10 breeds based on sales of bulls at auction in 2018 – Angus, Brahman, Brangus, Charolais, Droughtmaster, Hereford, Limousin, Santa Gertrudis, Shorthorn and Simmental. Information is collated both from individual sales results (click here to view completed bull sale sale summaries, and click here to view upcoming 2019 bull sales, which we are now starting to compile). Numbers sold at auction may not be a true reflection of the influence of a breed on the beef industry, because it does not account for paddock sales of bulls. For the dominant tropically adapted breeds, Brahman and Droughtmaster, for example, large numbers of bulls are not sourced via the auction system, but are purchased out of the paddock where no publically-accessible records are kept. Credible estimates suggest that up to 60 percent of all Brahman bulls employed in northern herds are either purchased from seedstock producers via paddock sales, or home-bred by commercial cattlemen who breed their replacement bulls from a nucleus bull breeding herd. Many of the largest pastoral companies, for example, breed most of their own herd bull replacements. Beef Central is now starting to compile its list of upcoming bull sales for the 2019 autumn and spring selling seasons. Breeders are encouraged to submit their 2019 sale dates for inclusion. Click here to access a form which can be filled out and emailed for submission as an entry for inclusion. We take this opportunity to thank all our stud stock advertisers for their strong and enduring support for Beef Central’s genetics section during 2018, and look forward to working with you again in 2019. Advertisers are advised that available advertising spaces fill up early, so we strongly advise booking your 2019 schedule as soon as possible. Contact Rod Hibberd [email protected] 0437 870 127 or Sally Inslay [email protected] 0419 471 578. Click this link to access Beef Central’s comprehensive list of beef breed record prices for bulls and females.